Probability follows seed this season, a departure from previous seasons. 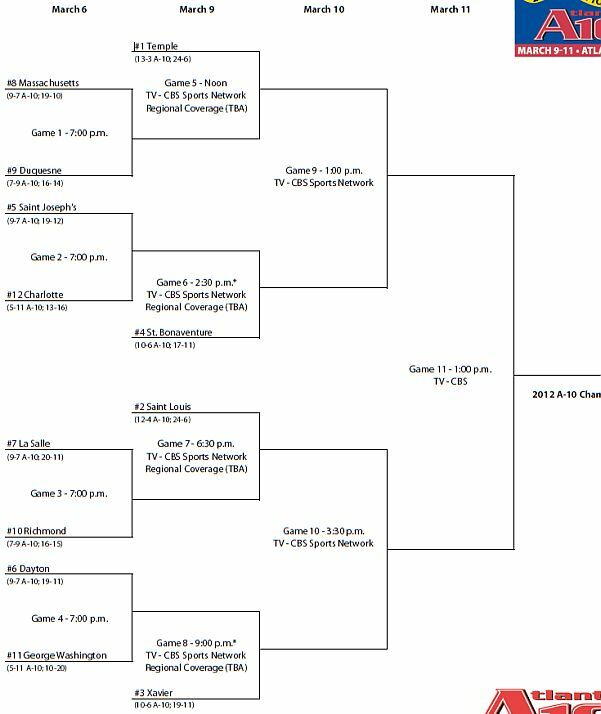 The Dayton/George Washington game will be a return engagement. The Flyers beat the Colonials by 16 at home last Saturday. A rookie coach with a team that may be overconfident could spell upset. But unlike 2010-11, the higher seeds in this round have proven over the last 16 games to be the stronger teams. Seed should hold. If Xavier, Saint Joseph’s and Dayton all win at least once more, the conference will boast seven 20-game winning programs for the 2011-12 season, only the second time in conference history when seven members collected 20 or more wins. Editor’s Note: Report written before Tuesday’s contests. Does Anyone Want to Win This Conference? One of the odder turns this late in the season is the sudden spate of losses suffered by upper division conference teams. Though Charlotte bounded out of the gate with two quick wins and Xavier stumbled mysteriously for much of January, the conference appeared on the way to sorting itself as January turned into February. Not so last week as the two conference elites, Temple and Saint Louis each dropped a game. Temple’s loss may be understandable as Saint Joseph’s is putting together a great turnaround from last season, but Saint Louis stumbled against bottom dweller Rhode Island, a squad that posted 20 losses before St. Valentine’s Day. The conference’s flagship program, Xavier, was in the midst of a late season push when they dropped a very important road decision to Massachusetts last Tuesday. Other notable late season hiccups, Saint Joseph’s loss to a young Richmond squad, La Salle’s three game losing streak (which has all but eliminated the Explorers from NIT consideration) and the aforementioned Massachusetts squad, whose win over Xavier is the only win in the last four games. Early season results hinted that the middle of the conference was stronger this season, a theory born out by the continued uncertainty over bye bids to Atlantic City even into the last week of conference play. The resurgence is not limited to the middle of the conference however. Consider that in each of the last two seasons the bottom two teams in the conference combined to win four games. This season Fordham and Rhode Island have combined for six wins, with at least one more before the seeds for the conference tournament are finalized Sunday. I have also noted several times over the last month that the points per possession margin between Saint Louis (at the top) and Fordham (at the bottom) is much closer than last season. With a loss to Saint Joseph’s last weekend Temple dropped back towards the rest of the conference, leaving Saint Louis virtually alone at the top with a wide, +0.04 margin in points per possession. 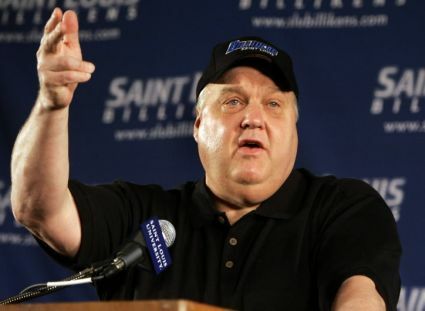 Comparing the statistics to the Billikens’ conference record (and especially the record of late), leaves one wondering if Saint Louis’ Top 25 status (as suggested by Pomeroy) is the product of an illusion fostered by the numbers or a genuine sleeper going into the postseason. The conference tournament may be the last best chance to gauge the Billikens before the NCAA opening rounds. The results last week produced a few strange late season upsets, but even more surprising is that the point per possession margins are beginning to align more consistently with conference records. Teams with losing records show negative point per possession margins, an expected pattern in theory that does not always play out in practice. 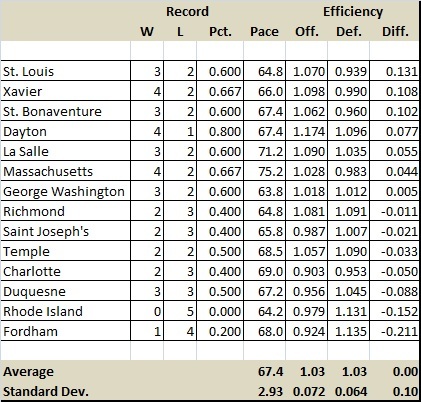 Saint Louis continues to be an outlier atop the conference and Massachusetts, which has an 8-6 conference record should, according to the Pythagorean Winning Percentage, show a 7-7 record through 14 conference games. The top teams developed a ripping case of hiccups at just the wrong time. If the power rankings do not look terribly different from last week however, consider that they all hiccupped at the same time. Saint Bonaventure moved up and La Salle crashed, but the other teams moved very little over the past week. 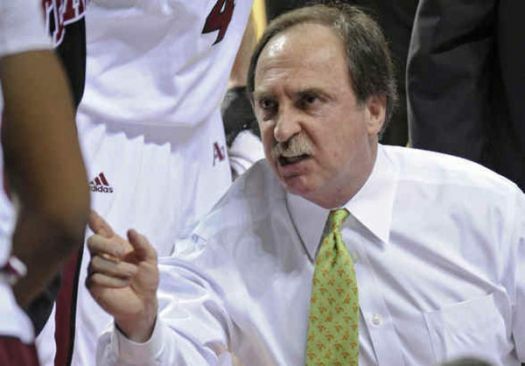 Ken Pomeroy has shown Saint Louis as the top team since late December, but college basketball’s stats guru looks at an overall margin as an indirect part of his formulation. For the past four weeks Temple posted the largest positive margin derived from conference games. Saint Louis and Temple were not the only two squads whose conference points per possession margins moved closer to alignment with their overall numbers. Count Richmond among those whose skew was rectified last week. The Spiders stubbornly posted a +0.006 points per possession margin even though the team was three games below 0.500 in conference play. Though the Spiders posted a “positive” 1-1 week, their points per possession margin slid into negative territory, consistent with their record. Though throughout the conference the records and points per possession margins do not align exactly with the won-loss conference rankings (see Duquesne above), the alignment is the most consistent in the three seasons I have tracked the numbers. Identifying and explaining the discrepancies will be one of the bullet points for next week. The race for conference Player of the Year was not a serious contest in 2011. Tu Holloway won recognition either as Player of the Week or at least a nod in nine of the sixteen weeks the conference posted weekly honors. Honored as Player of the Week six times, Holloway’s nearest competitors had not gathered more than two, one-third the number of times Holloway was honored. The Homogenization of the A-10: The surprise team through the first two weeks (Dayton) has fallen to earth with a 4-5 record at the halfway mark. Now what? 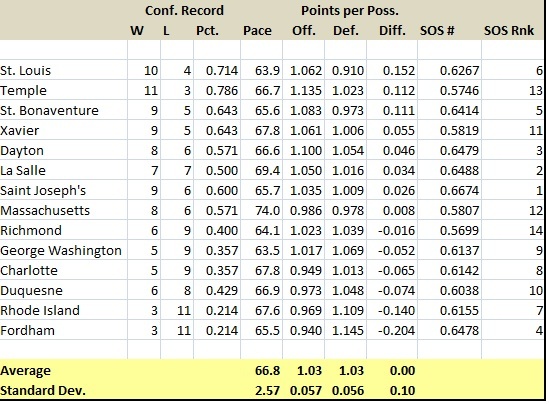 The points per possession table (conference game only) below may suggest the conference is breaking into a series of tiers (three for the top half of the conference, then everyone else … ), but the striking number is how closely the top and bottom teams are to each other, a hint at the parity also suggested by the first half won-loss records. In sharp contrast to this point (about mid-way through the conference regular season) last season, Temple and Fordham show a mere 0.353 difference in their points per possession margin, a much smaller gap than last season’s 0.512 margin. 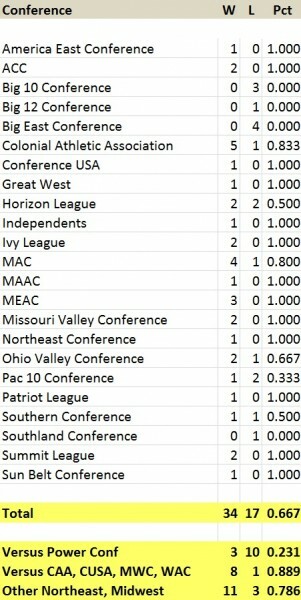 Note there are no undefeated teams at this point, last season two teams (Xavier and Duquesne) sported 7-0 marks. Fordham and Saint Joseph’s were looking for their first wins last season (both broke into the win column before the end of the regular season), while the bottom two teams this season have both logged two wins apiece. Parity of a sort perhaps, but is this a sign the conference is “better” or “worse”? 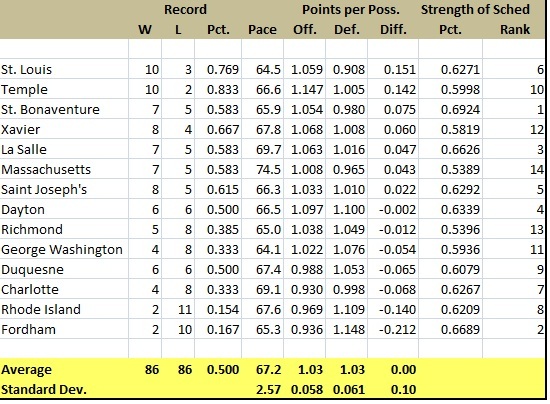 The computed conference strength of schedule (Number and Rank, leftmost two columns) suggest Temple’s record may be due in part to their slate of opponents. Early evaluations underestimated the strength of La Salle and Saint Joseph’s, two Big 5 rivals who did not give Temple much competition the past three or four seasons. This time around may be different though, as the Owls must play those two one more time, along with Xavier, Massachusetts and Saint Bonaventure. Temple’s last half of the season should prove more challenging than season’s past. New Sheriff in Town? The surprise team so far is Dayton. 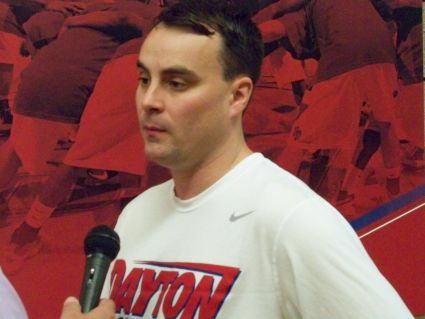 The Flyers, under first year head coach Archie Miller, have unveiled a revamped offense with a decidedly different approach to player rotation. Under Brian Gregory all members in the rotation, with the exception of forwards Chris Wright (graduated in May 2011) and Chris Johnson (a senior this season) saw game time in four minute (or less) slices. Wright, Johnson and freshman point guard Juwan Staten (who transferred to West Virginia in the off season) played 70% or more at their positions, which translates to about 28 minutes per game. The junior guard Paul Williams aside, everyone else on the squad logged no more than 44.2% of the available time (Josh Benson, about 18 minutes per game) at their respective positions. The rotation this season also features two players (transfer guard Kevin Dillard and Williams) who have logged better than 70% of the available time (with Johnson playing 63%), but Miller uses three other players for 50% or more of the time, and fourth, sophomore Devin Oliver, who plays about 46% of the time on the wing. If Gregory’s approach gave more players some game-time exposure, Miller’s style, more tradition in the distribution of minutes, allows team members to acclimate to the game. Though Miller uses fewer players per game, the Flyers continue to get a bit more than 66 possessions per game, consistent with the last season under Gregory. 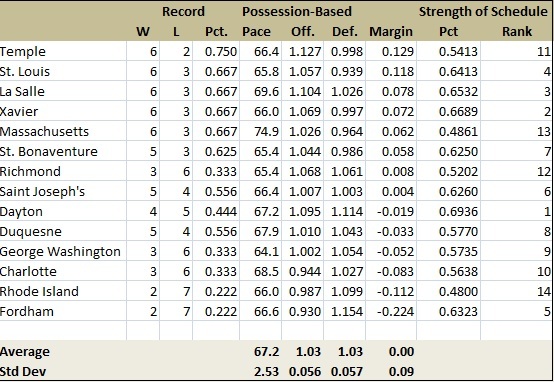 A Points per Possession Look at the teams. Last season I used points per possession (conference games only) to give the reader a more insightful look into each team’s play. The numbers for the 3-5 games the teams have played so far. Dayton continues to win, Xavier goes sideways while Charlotte and Richmond find the road rockier than expected? Looks like my promotion of Dayton last week was the right move as the Flyers handed Xavier a crushing 15 point loss last Saturday (1/21). The rematch next month in Cincinnati should be very interesting. Saint Louis (15-4, 3-2) – The Billikens beat Duquesne Saturday for their only game this past week. 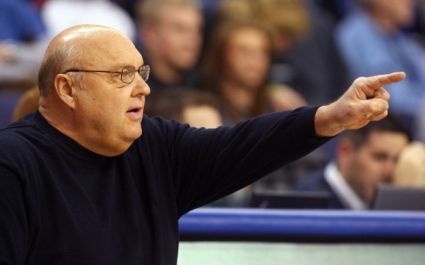 The conference record may not say #1, but the point per possession margin (+0.131 – see above) says Coach Rick Majerus’ team is on track. According to their Pythagorean Winning Percentage (conference games only) the Bills are on track to win 13 games, a very tall order given they have already logged 2/3 of their projected losses. Saint Louis has had problems winning away from Chaifetz, and the upcoming two game road swing will be an important early season test. Saint Louis will travel to Cincinnati for an early season showdown with Xavier on Wednesday (1/25) and then continue east to Amherst for a tilt with Massachusetts on Saturday (1/28). 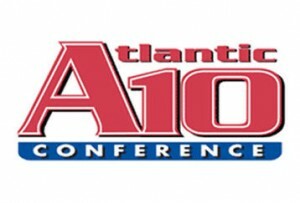 No A-10 Teams in the Top 25… Again: The latest round of the AP and Coaches polls (January 16) show no Atlantic 10 team gathered enough support nationally to be ranked… for the fourth consecutive week. Saint Louis missed a good opportunity to impress when the Billikens dropped a four-point decision to New Mexico on New Year’s Eve, picking up their second loss in the process. With the next six teams showing three or four losses, the conference is out of the Top 25 conversation for the next three or so weeks. The other name brands, Xavier and Temple, did not help their causes this past week. Xavier dropped their third game in the last four, this time to Gonzaga in what might have been a good “comparison” game for the Selection Committee. Temple beat #3 Duke but dropped two of their first three conference games. Lacking another marquee out-of-conference game (Temple versus Maryland is a pale imitation), the conference may have to wait until early February and hope that one or two teams will dominate conference play while their power conference counterparts beat each other up. Bernadette McGlade’s Recipe for Basketball Masala: Masalas are a variety of spicey soups or stews favored throughout India, Pakistan and most parts of south Asia. A-10 Commissioner Bernadette McGlade and her schedule maker served up their own brand of basketball masala in this opening week of conference play. Strong preseason favorites Saint Louis, Xavier and Temple did not survive the week undefeated (Temple has yet to win with a tough game coming up this week) while recently downtrodden Charlotte and La Salle started strong, each has sustained at least one loss. Rookie Coach Archie Miller of Dayton (whose squad was depleted with graduations and transfers) is riding high, while veteran Mike Lonergan of George Washington (whose squad is well stocked with experienced players) is struggling. Far too early to throw the power rankings (see below) up in the air perhaps, but a few of the results from the past two weeks (Dayton at Temple, Saint Louis at Dayton, Charlotte at Saint Joseph’s for example) maybe critical tiebreakers come March. Results from the first quarter of conference play (and a few of the last few out of conference games) hold a strong hint that the conference may be more competitive through the first 12 spots than preseason projections indicated. First week losses to the favorites force me to take a long second (and third…) look at Dayton. With only a few games scheduled, and those yielding mixed results for the teams at the top of last week’s power rankings, the conference appears to be sliding sideways. Massachusetts disposes of their last out of conference opponents fairly easily to move up a spot, while Temple finishes the month 6-1 and Fordham upsets a ranked team. In our attempt to bring you the most comprehensive Championship Week coverage anywhere, RTC is covering several of the conference tournaments from the sites. We have RTC correspondents Andrew Murawa at the Mountain West Tournament, Joe Dzuback at the Atlantic 10 Tournament and Kraig Williams at the WAC Tournament this weekend. In addition to live-blogging select games throughout the tournaments, they will each post a nightly diary with thoughts on each day’s action. Here are the submissions for tonight’s pair of championship games and the A10 semis. The only logical place to begin here is with Kawhi Leonard, who was dominant tonight. The line speaks for itself: 21 rebounds (a career high), including seven on the offensive end. 16 points. Holding Tre’Von Willis to 4/12 shooting from the floor (and at least two of those field goals came when SDSU inexplicably switched to zone at the start of the 2nd half). And throw in a couple assists and a couple steals for good measure. He definitely presents matchup problems for every team in the MWC, and he will present problems for teams across the country. Throw a smaller, quicker guy on him and Leonard will dominate in the paint; put a big man on him and he can step outside and use his face-up game. In the postgame press conference, UNLV head coach Lon Kruger was asked about the possibility of having to deal with Leonard for three more years, and the look that crossed his face (a combination of a knowing smile and a grimace) was priceless before he went on to spend a couple minutes singing Leonard’s praises. While New Mexico’s Darington Hobson and BYU’s Jimmer Fredette rightly are regarded as the best players in the conference, it is Leonard who is the most talented player in the conference. Willis tweaked his ankle late in the game on Friday night, and while he played without incident tonight, he was likely not as explosive as he was earlier in the tournament. How much of that had to do with the ankle and how much was the Leonard factor is up for debate, but Coach Kruger of course brushed off any notion that Willis was hampered by the ankle. The vaunted UNLV homecourt advantage turned out to be much less of an issue tonight than it was either last night or even on Thursday night in the quarterfinal. Maybe it was the earlier start, or maybe it was the Aztec fans’ inability to provoke the UNLV fans into a cheering confrontation as Utah and BYU fans did, but while the Rebel fans sure got loud when Larry Johnson and Jerry Tarkanian were shown on the scoreboard, they were never really a huge factor in the game. Last night in this space I talked up UNLV junior center Brice Massamba quite a bit. Tonight? Um, who? Massamba’s totals: 18 minutes, five fouls, two rebounds, two turnovers. Now, time for me to admit a couple areas where I was dead wrong. This doesn’t happen often (not me being wrong, I’m wrong a lot, I just rarely admit it – ask my wife), so soak it up. First, sometime in the middle of the MWC season I wrote that San Diego State junior point guard D.J. Gay was holding his team back and that head coach Steve Fisher should make the move to freshman Chase Tapley at the point. Well, Gay proved me wrong and Fisher right more or less from that point on. While Gay still doesn’t shoot a great percentage from the floor, he has really cut down on the turnovers over the back half of the schedule, and more important than anything the numbers show, he is the leader on this team. Guys like Leonard and Billy White and Malcolm Thomas and even senior Kelvin Davis are all major cogs for this Aztec team, but it is Gay who makes this team go. Look at his numbers over the tournament, and they’re nothing special (in fact, they’re downright awful): less than 8ppg, six of 26 from the field, 10 assists, five turnovers. And yet, they probably don’t get out of the quarterfinals without him (when he hit two clutch free throws at the end to provide the final margin), they certainly don’t get through New Mexico without him and his seven assists and zero turnovers, and tonight it was Gay’s big three in the face of Oscar Bellfield under six minutes that extended the Aztec lead above one possession for the first time since very early in the second half. Throw in the fact that the guy played 119 of a possible 120 minutes in this tournament (and the minute that he was out the Aztecs looked lost) and its clear Gay brings more to this team than his numbers would indicate. And, just to extend my praise of the guy, he is also a well-spoken, funny kid. The other place I was wrong is about Fisher. For several years now, I have been critical of some of Fisher’s in-game coaching and even his ability to bring along talent. While I thought his decision to open the second half in a zone for a couple of possessions was a similarly goofy decision, there’s really no questioning what he has done with this team. The vast improvement this team has made since opening night when they were absolutely drilled by St. Mary’s is clear and he has really gotten a talented team to buy into team over individual fully. Now, I’ll admit some of this may be because Fisher was just so charming and effusive in his press conferences that he won me over (tonight’s great Fisher quote, on winning the recruiting battle of Leonard over some Pac-10 schools: “we don’t need to get down on kneepads to recruit against the Pac-10.”), but the fact that he has taken a SDSU program with little history and put them in the postseason in seven of his 11 seasons, including now three NCAA visits, says all that needs to be said about Fisher’s ability to coach. The fact that he is just so likable is only a bonus. I chose Fredette, Hobson, Willis, Leonard and Gay as my five for the all-tourney team, with Leonard as my MVP, although I felt awfully bad about not writing down White, Chase Stanback or Dairese Gary. The official tournament team was Fredette, Hobson, Willis, Stanback, White and Leonard (no fair they got to pick an extra one – I wanted my all-tourney team to have eight guys), with Leonard the MVP.